It's not much more, but it's still more, and more is good. Subaru's 305-horsepower sport sedan is primed to get a little boost in power for 2019 - and you can thank the limited-edition from 2018 for the upgrade. According to , a document sent by Subaru to the National Highway Traffic Safety Administration and published on April 11th showed a jump of 5 horsepower for the 2019 , bringing the total number of ponies to 310 from its 2.5-liter turbocharged boxer four-cylinder engine. The WRX and WRX STI still live atop the previous-generation Impreza platform, even though that model moved to new bones for the 2017 model year. The Crosstrek, which is more or less a jacked-up Impreza-based crossover, made the switch to the new platform for 2018. 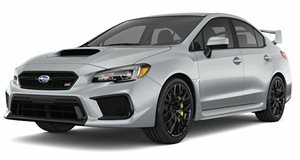 The WRX and STI models aren't expected to adopt the new architecture until 2020.